ON24 announced a new online offering today. They call it Insight24. The easiest way to summarize the functionality is to refer to it as a searchable database of archived recordings. Any company can submit a link to an archived video, webcast, or podcast recording along with a description and some category information. The link and the description are listed in category-specific groupings and interested audience members can click through to the content. The functionality is somewhat similar to my own WebEventSearch.com, so I was very interested to take a look at their implementation. One of the great things that ON24 has done is to use a "single signon" concept for collecting information from users searching the database. You only have to enter your identifying information once instead of entering it on each company's separate registration page for their content. Of course the information you enter is tracked and passed on to each content provider you visit. ON24 only accepts recorded content for their listings database. There are no links to upcoming live events. I spoke to Cece Salomon-Lee, the Marketing Communications Manager at ON24, who told me that they only carry links to content produced within the last year. So you shouldn't find yourself trawling through long outdated webinars. Search functionality lets you use keywords, category labels, and dates to narrow your results. There is no way to search within a returned list to further narrow it down. Topic categories are pre-established by ON24 and cover 31 topics heavily oriented towards high-tech B2B concerns. Cece said that they are not targeting any Business-to-Consumer broadcasts. Listings use a symbol to indicate whether they are webcasts with visual content or audio-only podcasts. Audience members can send information on a link to another email address, they can assign a 1-5 star rating (much like Netflix) and can add tag words or comments. Interestingly, ON24 allows users to add anonymous comments, which has the potential for abuse over the long haul. As a provider, when you submit a media link to the database you can tag it with up to three categories. Cece indicated that ON24 will verify each link to make sure it is appropriate and in the proper categories. That seems like a lot of manual labor if they want this to scale! Adding webcasts recorded from ON24 live events is very easy, as you only need the ON24 event ID. However the database accepts links to recordings made with any technology, including ON24's direct competitors in the web conferencing industry. Currently all listings are free, as ON24 tries to build up the library of available content. Eventually they plan to make this a revenue generating service, where they will charge for special placement (for instance, a banner sponsorship in a category) or for delivering a certain number of leads to the provider. Details have not been announced on when they might start charging or what the pricing model will look like. There is a natural barrier to get past when starting up a service such as this. Providers don't want to spend time manually adding entries to the database until they see a lot of search traffic to make it worthwhile. And searchers don't want to bother using the service if there isn't a lot of content available. ON24 has the advantage of being able to seed the database with recordings from their large list of client events. But the first recording I tried linking to turned out to have been made withWebEx, so it shows that there is already a base of information from various sources. Recorded content is starting to get a lot more attention in the web conferencing and rich media world. 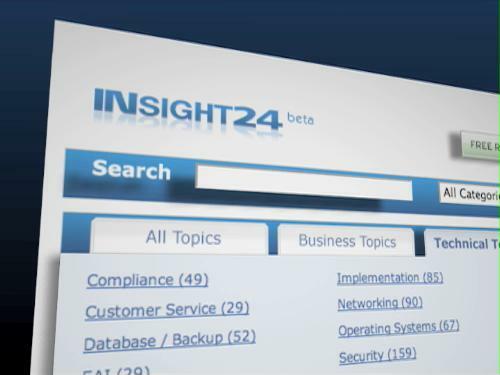 Insight24 should add some nice conveniences for users attempting to find and access information of interest to them.